Have you been laboring for months and spending thousands of dollars trying to demystify the search engine optimization puzzle? Are you trying to figure out how to use Facebook to get traffic to your website? Pause… Consider PPC or Pay Per Click services, made available by major online brands, such as Google, Yahoo and Facebook. You can reach out to the millions of users of these online brands and you pay only when you get results. There are several misconceptions about PPC campaigns. You can easily find an SEO company condemning PPC campaigns as wasteful investment. It is a fact that PPC campaigns do not always spell success. However, this situation occurs only when you do not have the requisite knowledge to run such a campaign. Here’s your chance to learn the fundamentals of a successful Google, Yahoo and Facebook PPC campaign. Drive thousands of visitors to your website without wasting time and efforts on understanding Google’s search algorithm. Harness the power of the best online brands to boost sales on your website. 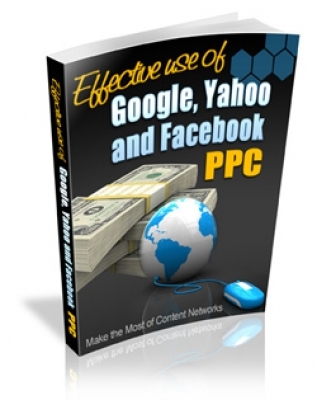 Read ‘Effective Use of Google, Yahoo and Facebook PPC’ and take control of your website traffic. Follow the strategies in this book. Sign up for a PPC campaign on Google, Yahoo and Facebook. Create an ad for your website. And that’s it!